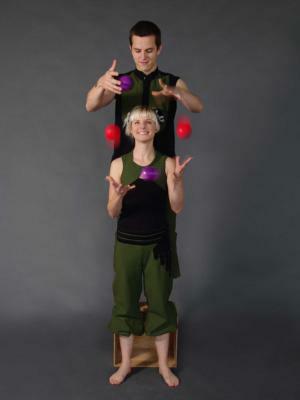 Bri & Brian wow audiences with their skill, personality, and tightly choreographed juggling routines. 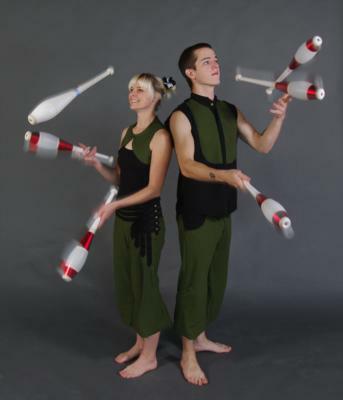 This juggling duo offers comedy juggling for the family, theatrical style circus acts, and also ambient entertainment for parties and events. Bri & Brian have been well received in local theaters, world wide juggling festivals, and other community events in the Bay Area. Any audience will love Bri & Brian's playful camaraderie, teamwork, and stage presence. Contact them today for your event or show! Please note Bri & Brian: Juggling Entertainment will also travel to Alameda, Piedmont, San Leandro, San Lorenzo, Castro Valley, Emeryville, Moraga, Berkeley, Hayward, Orinda, Rheem Valley, Canyon, San Francisco, South San Francisco, Walnut Creek, Belmont, Albany, Lafayette, Brisbane, Alamo, Danville, Richmond, El Cerrito, San Mateo, San Ramon, Union City, Burlingame, Daly City, Diablo, Dublin.